Meade County, Kansas, is located in the semiarid area of southwestern Kansas along the Oklahoma border. It was not until the late 19th and early 20th centuries that this part of Kansas was transformed from prairie grazing land into tilled agricultural units. Mennonites from Jansen, Nebraska (Kleine Gemeinde), and Inman, KS, were among the early settlers. The first two Mennonite families were those of Peter F. Rempel and Jacob B. Friesen, both from Nebraska, who settled on homesteaded land approximately ten miles (16 km) south of Meade (pop. 1500) in 1906. In 1957 there were two Mennonite congregations in Meade County with a combined membership of 400. One congregation belonged to the Evangelical Mennonite Brethren Conference and the other, the Emmanuel Mennonite Church, was unaffiliated but was formerly a part of the Kleine Gemeinde. The family names of Bartel, Ediger, Friesen, Isaac, Loewen, Rempel, Reimer, and Wiens predominated. Fretz, J. Winfield. "Meade County (Kansas, USA)." Global Anabaptist Mennonite Encyclopedia Online. 1957. Web. 21 Apr 2019. http://gameo.org/index.php?title=Meade_County_(Kansas,_USA)&oldid=92678. Fretz, J. Winfield. (1957). Meade County (Kansas, USA). Global Anabaptist Mennonite Encyclopedia Online. 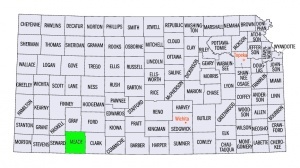 Retrieved 21 April 2019, from http://gameo.org/index.php?title=Meade_County_(Kansas,_USA)&oldid=92678. Adapted by permission of Herald Press, Harrisonburg, Virginia, from Mennonite Encyclopedia, Vol. 3, p. 546. All rights reserved. This page was last modified on 23 August 2013, at 14:09.